On Monday night the St. Louis County Grand Jury failed to file any criminal charges against police officer Darren Wilson who shot to death 18-year-old African American youth Michael Brown on Aug. 9 in Ferguson, Missouri. This is another outrageous act of the racist system here in the United States. 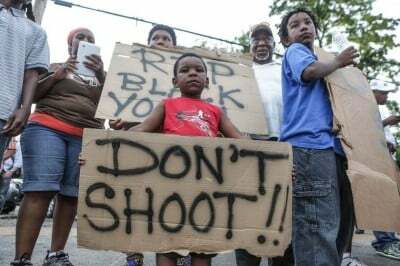 African American youth are gunned down in cold blood by police, vigilantes and others who are allowed to go free on a regular basis. Brown was criminalized in his death while the system supports the genocide of an entire people claiming it is justified. Join with the Michigan Emergency Committee Against War & Injustice (MECAWI), Fight Imperialism, Stand Together (FIST), the Moratorium NOW! Coalition and others to protest this denial of justice and the reinforcement of the racist status-quo. We will gather on Tues. Nov. 25 at 4:30pm at Hart Plaza located on Jefferson ave. and Woodward in downtown Detroit. Please bring signs and banners expressing your displeasure with this latest travesty of justice. This incident involving the attempt to justify the killing of Brown is not taking place in a vacuum. A 12-year-old African American youth Tamir Rice was killed over the weekend by Cleveland police. Eric Garner, an African American grandfather, was killed by cops in Staten Island, New York during the summer. The list of such victims of police terrorism goes on. We must continue to demand justice for Michael Brown. The federal government must file criminal civil rights charges against Darren Wilson and all those involved in the killing of Brown and the attempted cover-up of this heinous crime. Despite the U.S. government’s claims of representing democracy around the world, people internationally can see that this is the worst county to be a person of African descent. Let us reflect and plan to counter this new wave of racist violence by taking to the streets demanding justice and the end to police terrorism.